So, pantomime is popular again . Oh no it’s . 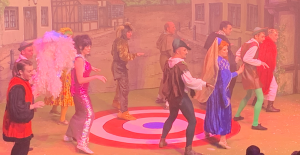 Even more so, adult panto, despite its sleazy 70 origins is popular as well. Thurrock’s favourite pantomime dame is at it again. 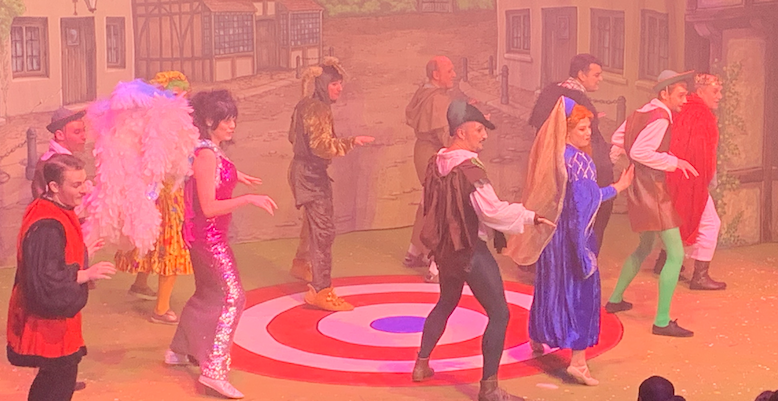 Luke Coldham, fresh from the Thameside Panto launches his second running version of Rubbin Hood following on from last year’s huge success with Thurrock Courts Players. This time though its at the wonderful Mirren Stage at The Towngate Theatre in Basildon and its just the right size of venue for this sort of nonsense . Rubbin Hood is of course a twist on the traditional show but this time it’s certainly not for the vicar or children or anyone who is easily offended. There are no barriers and the script doesn’t hide under any bushes. And there are bushes. Machine-gunned Christmas cracker jokes are fired at the willing victims but this time these jokes are not for Grandma. Rude, crude and way way below the belt the audience loved them. Encouraged to shout at the wicked sheriff (a magnificent Wayne Prince incidentally), the audience roared in unison in telling him to go forth (well you get the picture). Yes, there were groans at some of the material and on occasion a sharp intake of breath but I always glance along the aisles at these shows and the patrons were lapping it up. Listen to the noise when a crowd move out of the theatre and if its noisy with chatter it means they loved it. The bar was noisy and they did love it and rightly so. Strong performances from a cast who worked well together. The colour, the set, the sound (Sam Jones must be the best sound guy in the south of England) and the dancing exceptional. Tom Andrew Smith’s choreography was spot on and he shone in a wonderful new scene based on Swan Lake which was one of the highlights of the show. Jordan Gray kept everything together and can add another string to her bow along with musician and comic. Man of the match for me was John Oakes who really knew how to work the audience and had a delicious sense of timing. I’m not going to list who did what part but suffice to say there were no weaknesses here. This may not be your cup of tea and its not a cheap cup of tea but if you can leave your morals at the door and your censorship then you will totally enjoy. This show runs until the 28th January with a couple performances sold out already.